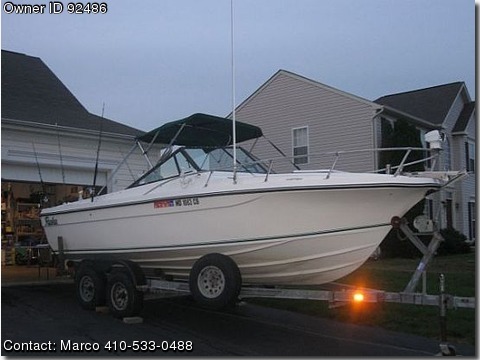 Call Boat Owner Marco 410-533-0488. Well maintained and unwinterized for the season. Engine rebuilt two yrs ago. Alpha drive 6 yrs old. New starter, Engine water pumb and alternator. The boat taken for test run and everything is working great. Boat handles well in rough water-heavy sharp-V bottom, great for Rockfish fishing. Call me to coordinate a viewing test run. Asking $6,600.00-OBO. (Don't bother calling asking me to open a Paypal account or that you're having your AGENT pickup the boat!